Would it rain? Perhaps everyone was heading to Majors Creek who decided to host their festival on the same weekend. Still it was summer(ish) and the moon was full although a little late in rising and the time had arrived for another fabulous Backyard Backanalia. Warming our cockles and tickling our underbellies began with a surprise blackboard appearance by Beth’n’Ben who seemingly go from strength to strength. Maybe it was the matching jeans, vests and sunglasses or maybe it was the plastic carnations that graced Ben’s manly frame, whatever it was the dynamic duo managed to fire up the appreciably large early crowd and set the stage for another musical feast. And what a feast it was! Rachel Armstrong blew everyone away with her poise and music. Sidney Creswick, recent ACT winners of the campus band comp partied with the younger set and the lettuces in the garden. Owen Campbell, after months overseas, popped in to give us a taste of his brilliant slide guitar and rasping blues while men with ridiculous hats and even more silly capes, Nozl, closed out the louder part of the evening. The entrees and main courses greedily consumed, it was time for dessert. Despite having to lug her piano by bicycle all the way back from Majors Creek, Bec Taylor managed to get back in time for Hashemoto who enchanted us with another vintage performance. Of course it wouldn’t be a Baccy without The Cashews. Playing from the balcony they tossed around another helping of nutty goodness aided by an impromptu table dance from Dr Jim Boots. As the moon got higher the party wound on. The faithful gathered around the fire basking in the afterglow of yet another awesome Backyard Backanalia. Who knows if it really was the last, but it was sublime. Saturday evening last saw the final Backanalia of the 2008/9 season, held in its new location in deepest darkest suburban inner north Canberra. By all accounts it seemed to go off very nicely with great performances by the aptly named Fun Machine, Julia and The Deep Sea Siren, Simone Penkethman, The Wedded Bliss and Dr Stovepipe (with a little bit of Fireside Revelry thrown in gratis). Also, no complaints from the neighbours. It was back to the Backanalias of old, with lots of kids amongst a broad age range present, a pleasantly packed house, beautiful weather, crackling fire bins and a general ambience of bon homie. Or so I felt it. I hope the Stateline cameras were able to capture some of that feeling, they having partially inspired the staging of this Backanalia as they wanted to film local ‘underground’ music in action for a segment possibly airing on Friday. So we’ll see. They also filmed the Guerrilla Gig the next day and The Bootleg Sessions at the Phoenix on Monday, both of which were great gigs in their own special way. Sorry to those of you who were planning to attend, and those who were going to play, but we have decided to cancel tonight’s Backanalia due to persistent gusty wind and the threat of rain. It was a tough decision but the good news is all the infrastructure is in place for a show and we may well just do the same line-up next Saturday, 20th Dec, depending on everyone’s availability of course. Sorry folks, we’re pulling the plug. The confluence of big angry clouds and a small, possibly justifiably, angry woman, has given us the willies. Hope to see you at the next first one in December at the new location. Also, if you want to see how these things play out in the public domain, check this. Frockanalia, Backyard Backanalia, Sat 21st Jun, 2007. Well my my…. it”s amazing the things that can happen when you put on a dress…strange gestures…accentuated S”s…. the words “Sweety” and “Darling” instantly take up %50 of your vocabulary and you start using words like “ensemble” in order to describe an outfit. Last Saturday was indeed a Grande Affair at Loadedog Headquarters for the first winter backyard gig… Frockanalia!!! 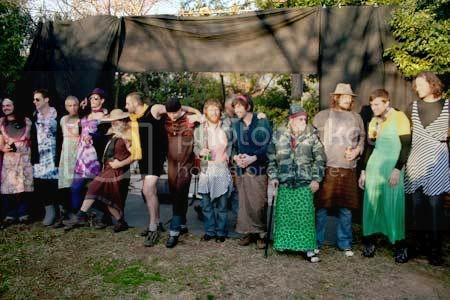 Many of the menfolk scared the punters at the North Ainslie Primary fete as they decided to frock up instead of paying the $5 penalty and it was quite a sight when they all lined up at the front of the stage for photo ops. Such a sight we had to attach a pic. I think you”ll find a clear winner in the purple ensemble. There were some stella performances with Tabatha Omaji, Ashley Walsh, Cathy Petocz and the Glaciers springing out. The wine flowed, the food may or may not have done the same and once the official music was done with there was much singing around the campfire. To think the Gods almost ruined it with bad weather, then pulled glorious sun and blue skies out of the bag at the last minute. I tell ya I can’t believe our luck . It’s one of those beautiful, crisp, sunny, Canberra winter days! Perfect for sitting around in a back yard listening to music. Get thee to the Frock! In a Frock. And have a frocking good time! A fine, mainly sunny day with light to moderate southwest to westerly winds. A final announcement will appear here by 9am or so.